PETOPPIA is an online pet bloggers community and the best resource for pet articles. We publish useful information and tips on how to care for your pets. We are now offering you the chance to share your very own pet stories and ideas with us through submitting a guest posts. If you are a pet writer or you want to promote your pet products through guest posting, we have the perfect opportunity where we can help each other and the pet loving community. You can send your guest post request at – hello@petoppia.com. Most of us have pets at home and always looking for information to help with the proper care of our the pets. You have the chance to reach and share your story with our readers through guest post contributions. By sharing some useful tips and tricks you can help pet owners find easy solution to their problems and at the same time promote your brand. PETOPPIA is the best pet blog community that brings together like minded people together to share, learn and help each other to take the right products for our pets. Our aim is to provide reliable and useful information on pet caring for the thousands of pet owners from around the world looking for pet caring ideas and tips. By becoming a guest post writer you have the opportunity to help these people and grow the community through sharing of high quality content. And at the same time to promote your brand to the right audience. Benefits of Submitting Guest Post…. By sharing your article with us you have the chance to publish and promote your articles and reach the targeted audience to promote your brand in the right the perfect platform. Regular sharing of high quality articles gives you the opportunity to establish yourself as an pet expert, giving you the credibility your are looking for. You will get tons referral traffic through per guest posts. We have a growing audience and you have the chance to get noticed by many pet owners. You can build a writer portfolio and create a very impressive resume as a writer too. Headline – Include a headline that will immediately catch attention and create interest in readers. It needs to be descriptive and informative for the visitors to get the clear idea about the content to be followed. Length – We prefer lengthy but quality pet articles. An article of length between 1000 and 1500 is preferred. It gives the readers a chance to explore the topic in depth and also skim details they are looking for. Article style – Readers are looking for solution, tips and suggestions on the best ways they can take care of their pets. Make sure to write the guest pet article keeping the readers in mind. We have a varied reader base, so we welcome all styles of writing with relevant images, layout and heading & sub-heading. Add Citation links – You can add relevant links based on your article. Readers will get more content to read and refer to. Add an intro: You can add a short bio introducing yourself. Images – Images can make an article interesting and easy to understand. It’s fun to read article with relevant pictures. We welcome all kinds of pet guest posts on how to care your pets. However, we have very strict pet guest post guidelines for accepting articles as we want our readers to have the best content catered to their need. We want to ensure they get best quality and original article. The pet guest post you will be submitting must be your original work free of any plagiarism. You need to ensure that the article will not been published elsewhere once approved here. You must have the copyright of your work. Make sure that you have full right over the content. You will retain the rights of your content. You name will be published indicating you are owner of the article. We retain the rights to publish/edit/remove of your post on our website without prier notice. We must have exclusive publishing rights of the article. This means your article will not feature in any other website as long as it remains published in PETOPPIA. We don’t pay for the guest posts that are published on our website. We believe in free sharing of information and ideas and help the community grow. 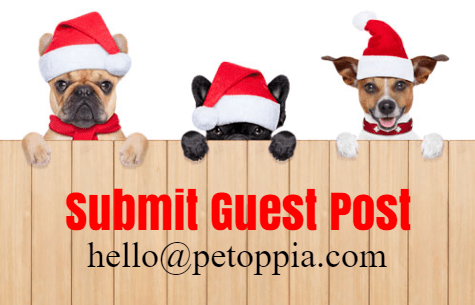 Submit your pet guest post article to us today!